I’ve been busily reading my way through a few excellent novels of late, so thought it might be time to come here and share my thoughts with you all! First up, it’s time once again to return to the Horus Heresy, and finally get to meet the Ultramarines properly at book 19: Know No Fear! 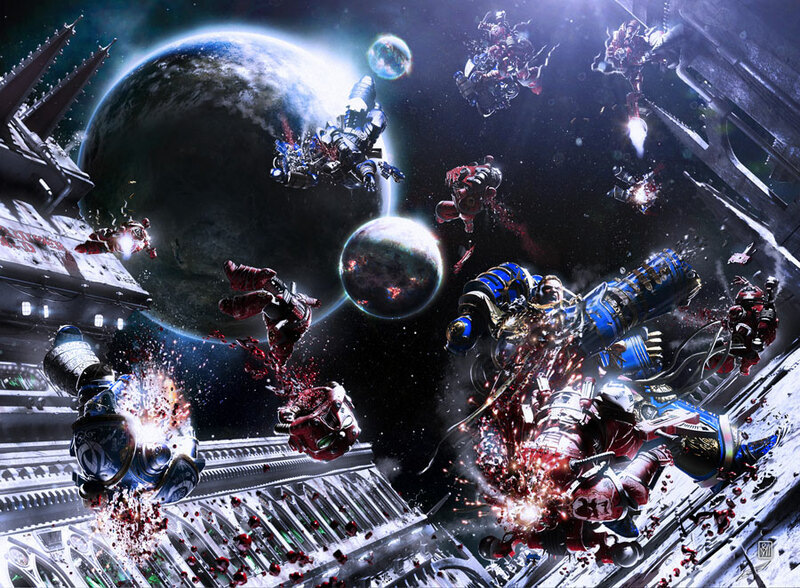 The book builds tension until about a third of the way through, where a ship crashes into one of the orbital platforms above Calth, and all hell breaks loose as the Word Bearers open fire on their fellow Astartes. Guilliman first thinks it a mistake, that the Word Bearers had thought themselves under attack and, paranoid after Monarchia, have immediately opened-fire on the Ultramarines in self-defence. But no, it doesn’t take long for the Ultramarines to realise that the Word Bearers are hell-bent on the destruction of their legion. Unfortunately, the noosphere has been knocked out by the attack, so vox traffic is halted. With no way to coordinate their defence, thousands of Ultramarines are killed. However, the Mechanicum and the Ultramarines resistance soon manage to turn the tide, and Guilliman himself just about manages to thwart Kor Phaeron’s plan to annihilate his legion, but the Word Bearers have already unleashed several bombs on Calth’s star, causing terrible radiation poisoning of the planet, and driving the war into the catacombs and arcologies. I really wanted to like this book. Dan Abnett is, of course, a fan favourite, and I had been looking forward to seeing the Ultramarines properly in the Horus Heresy. However, I felt it was a little bit drawn out in terms of the initial impact of the Word Bearers attacking the orbital platforms, then it seemed to end quite abruptly, with an epilogue set long after the subterranean battle had ended. It was a bit of an odd one, and I can’t quite bring myself to say it was that great a book. I mean, Horus Rising was wonderful, and Legion is one of my all-time favourites, so I suppose I was expecting more. I don’t know. I did enjoy the disaster-movie-feel that a lot of the novel had, and I think it was done really well to sustain that over the course of almost the whole novel. The initial cataclysm and subsequent scattered resistance was really good, though I think I would have liked to have seen more from the Word Bearers’ perspective. It’s also worth noting that the novel is told in the present tense, which I always feel makes me read it faster than I would otherwise. Instead of chapter sub-headings, we have the “mark of Calth”, the time-stamp of each action described within said chapter, in relation to the initial attack of the Word Bearers. It gave the novel an added sense of urgency, which I think works really well alongside the disaster-movie approach. It’s nice to see Guilliman in the Heresy at last, and I enjoyed seeing the Ultramarines at war en masse. A lot of people write Guilliman off as boring, but I’m always fascinated to read about him and his incredibly tactical brain. He’s written as being the tactical genius of all the Primarchs, and that comes out here when we see him digest dozens of battle reports at once, to form a plan of attack within minutes, while everybody is stood around him looking vaguely dumb. Some personality quirks – such as his preference for using a stylus – are carried over by the Dark Imperium novel, which I also enjoyed. He’s definitely a more interesting character than people give him credit for, and I think anybody who is bashing on the Ultramarines should take the time to read something like Know No Fear, to see how effective and badass they can actually be! All in all, I think I was expecting more from the novel, so felt a little let-down, but still enjoyed a lot of things about this book. Probably not one of the stand-out books from the series, but definitely not one to pass over!